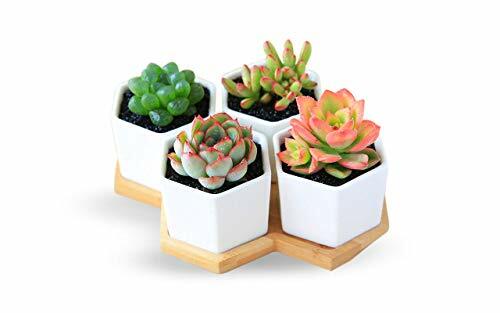 Set of 4 hexagon succulent pots with bamboo saucer, perfectly for displaying live potted plants, flowers, small cactus and succulents. Unique and modern design, adorable for your table top or windowsill. Perfect gift for family and friends who love succulent plants with a green thumb or keep it in your own home for a touch of clean, modern style in your living room. ✔️ GEOMETRIC & MINIMALIST DESIGN – Sleek white ceramic hexagonal shaped planter. Provides a modern, geometric style to your table top, windowsill, kitchen, balcony, or garden. This is the ideal gift for Housewarmings, Birthday parties, Valentine’s Day, Mother’s Day, Christmas etc. Give this planter set as a gift to a friend with a green thumb! ✔️ BAMBOO TRAY – The bottom base is a beautiful bamboo tray where the pots sit. Used to collect the drained water and keep the area dry. Measures 7.5 x 5.5 x 0.4 inches. ✔️ ULTRAHARD QUALITY – Hand made with high temperature ceramic, making them stronger and more durable than regular ceramic. Easy to store and clean. ✔️ 100% SATISFACTION GUARANTEED – 30 days return, refund or free exchange policy without hassle. You can get the full refund quickly or free replacement if you are not completely satisfied.